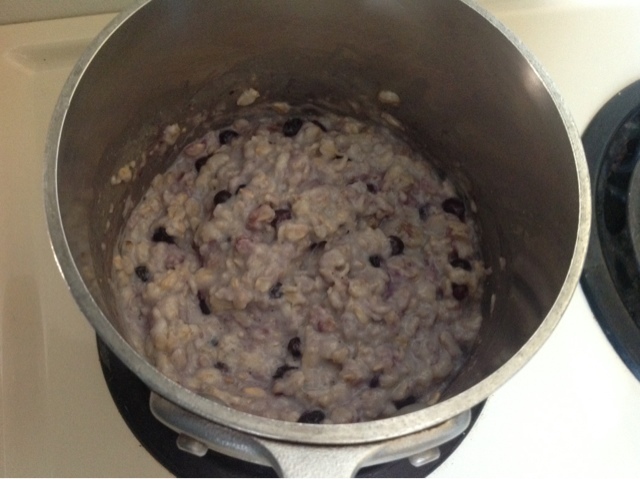 Lately, our favorite breakfast has been Blueberry Flaxseed Oatmeal. I do like to "soak" our oatmeal overnight with a little yogurt or whey to help the oats give up all of their nutritional goodness (as suggested by Sally Fallon in her book Nourishing Traditions) but I do not always remember to do so. This is still a very hearty breakfast that can even satisfy my low-carb, bacon-loving husband. I do not use exact measurements for this one, so take a look at my ingredients and add as desired. For approximately 3 servings of oatmeal, I use half water and half milk, according to the instructions on the box. We buy old-fashioned oats in bulk from Costco. They are a good deal. I add the salt and then a pat of butter (preferably pasture-raised like Kerry Gold from Costco-what I am using now-or Organic Valley). Next comes coconut oil (about 1 tablespoon) and flax seed (about 1-2 tablespoons). I cook this all according to the directions(low and slow is best) until cooked. Then I add lots of plump, anti-oxidant rich wild blueberries (frozen, from Costco). I serve mine with a small pat of butter and a splash of pure maple syrup. Yum!